You try to avoid them, but mistakes happen. Then you wonder, is it possible to correct SEO mistakes? Stephan Spencer, co-author of The Art of SEO, says it is. Stephan says there are some common blunders content marketers make that can be fixed. 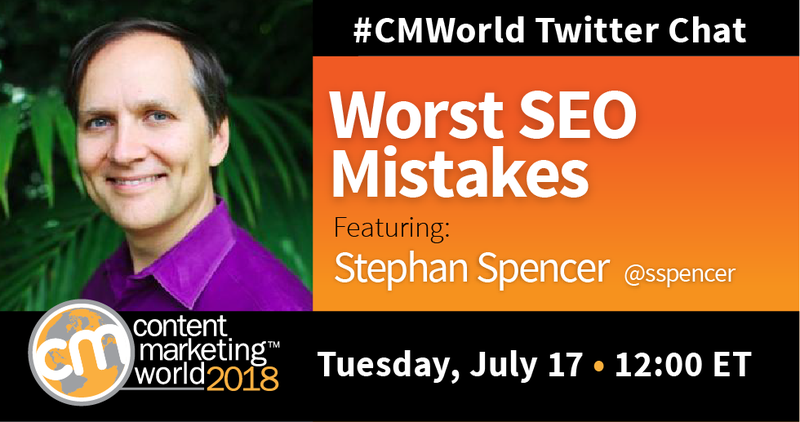 He joined us on a recent #CMWorld Twitter chat to share some solutions. When looking to make improvements for better organic search results, what can you fix on your own? How will you know if it’s time to hire an SEO specialist? If you are buying a keyword phrase, is the performance from paid search enough? Do you still need an SEO strategy? A3. If you are happy with paid #SEM advertising performance then maybe #SEO isn’t as important to you. It would be impossible to put together a post that covered every aspect of search engine optimization. Fortunately, there are several ways marketers can stay in-the-know. First, check out our Twitter Moment for this chat. Next, you can bookmark these SEO resources our community suggests. Stephan says his favorite articles include those he has written for Search Engine Land. What are your go-tos? Did we miss any of your favorite SEO resources? Let us know in the comments below. Give your SEO efforts a boost. Learn from Stephan and other industry pros at Content Marketing World. Buy your ticket today with code SM100 to save $100 on your registration.